What is one way an applicant may contest an objection? asking the examiner to reconsider it. filing a petition to the Commissioner. The answer to this question can be found in chapter 700 of the MPEP. This chapter covers the examination of applications. This question comes from section 706.01 of the MPEP. The following is a brief summary of section 706.01. This section covers the differences between rejections and objections. The practical difference between a rejection and an objection is that a rejection, involving the merits of the claim, is subject to review by the Patent Trial and Appeal Board, while an objection, if persisted, may be reviewed only by way of petition to the Director of the USPTO. What are the two types of double patenting rejections? There are generally two types of double patenting rejections. The second is the “nonstatutory-type” double patenting rejection based on a judicially created doctrine grounded in public policy and which is primarily intended to prevent prolongation of the patent term by prohibiting claims in a second patent not patentably distinct from claims in a first patent. The answer to this question can be found in chapter 800 of the MPEP. This chapter covers the Restriction in Applications Filed Under 35 U.S.C. 111; Double Patenting. This question comes from section 804 of the MPEP. The following is a brief summary of section 804. This section provides specific details on double patenting. Essentially, double patenting seeks to prevent the unjustified extension of patent rights beyond the term of a patent. This section covers when double patenting is possible along with the requirements of double patenting rejections. Obviousness type nonstatutory double patenting is also discussed including two-way obviousness. This section also discusses disclaimers which may be used to disclaim or dedicate part of a patent term. The topics discussed include terms, terminal disclaimers, statutory double patenting rejections, and nonstatutory rejections. List at least one type of filing that third-party submissions may not be directed to. The answer to this question can be found in chapter 1100 of the MPEP. This chapter covers the Statutory Invention Registration (SIR); Pre-Grant Publication (PGPub) and Preissuance Submissions. This question and answer comes from section 1134.01 of the MPEP. The following is a brief summary of section 1134.01. This section covers third party submissions under 37 C.F.R. 1.290. The America Invents Act (AIA) amended 35 U.S.C. 122 by providing a mechanism for third parties to submit printed publications in another party’s patent application. Third-party submissions under 37 CFR 1.99 were eliminated as of September 16, 2012. This section covers the time for filing a third-party submission along with the content requirements for a third party submission. The type of information that may be submitted in a third-party submission is limited to patents, published patent applications, and other printed publications of potential relevance to the examination of a patent application. However, any third party may submit for consideration and inclusion in the record of a patent application, any patent, published patent application, or other printed publication of potential relevance to the examination of the application. List two examples of the type of descriptions of the interest conveyed or transaction to be recorded that can be identified. The answer to this question can be found in chapter 300 of the MPEP. This chapter covers ownership and assignment. This is from the 9th Edition, Revision 07.2015. Depending on future changes to the MPEP, the question and answer may or may not be applicable in later Editions or revisions. This question comes from section 302.07 of the MPEP. The following is a brief summary of section 302.07. This section covers details on how the assignment document must be accompanied by a cover sheet. What should an Applicant Initiated Interview Request Form include? An Applicant Initiated Interview Request Form should identify the participants of the interview, the proposed date of the interview, whether the interview will be personal, telephonic, or video conference, and should include a brief description of the issues to be discussed. The answer to this question can be found in chapter 400 of the MPEP. This chapter covers representative of the applicant or owner. The question is from the 9th Edition, Revision 07.2015. Depending on future changes to the MPEP, the question and answer may or may not be applicable in later Editions or revisions. This question comes from section 408 of the MPEP. The following is a brief summary of section 408. When an applicant is initiating a request for an interview, an “Applicant Initiated Interview Request” form should be submitted to the examiner prior to the interview in order to permit the examiner to prepare in advance for the interview and to focus on the issues to be discussed. List a situation in which drawings are usually not considered necessary for the understanding of the invention. Articles, apparatus, or systems where sole distinguishing feature is presence of a particular material. The answer to this question can be found in chapter 600 of the MPEP. This chapter covers the parts, form and content of the application. An “applicant shall furnish a drawing where necessary for the understanding of the subject matter sought to be patented.” Applications filed without drawings are initially inspected to determine whether a drawing is referred to in the specification, and if not, whether a drawing is necessary for the understanding of the invention. This section covers what happens in instances where the application does not require a drawing as well as those that do require drawings, but was filed without. Name two individuals who through written authority may grant access to a provisional application. or, for an application filed on or after September 16, 2012, an applicant other than an inventor. The answer to this question can be found in chapter 100 of the MPEP. This chapter covers Secrecy, Access, National Security, and Foreign Filing. The answer is from the 9th Edition, Revision 07.2015. This question comes from section 104 of the MPEP. The following is a brief summary of section 104. This section discusses who has the authority to grant access to applications. The authority to grant access is different for applications filed before and after September 16, 2012. This section also discusses who may access patent applications (both provisional and nonprovisional) and Board records. List two significant differences between nonprovisional applications and provisional applications. No claim is required in a provisional application. No oath or declaration is required in a provisional application. Provisional applications will not be examined for patentability. A provisional application is not entitled to claim priority to any foreign application or the benefit of any earlier filed national application. The answer to this question can be found in chapter 200 of the MPEP. This chapter covers types, cross-noting, and status of application. The question and answer is from the 9th Edition, Revision 07.2015. An applicant may file a utility, plant or design patent application. This section covers the many different types of applications including national and international patent applications along with the different types of filings (i.e. provisional, nonprovisional, divisional, etc …). Name two types of correspondence that may not be transmitted by facsimile. Correspondence relating to registration to practice before the Patent and Trademark Office in patent cases, enrollment and disciplinary investigations, or disciplinary proceedings. A request for supplemental examination. The answer to this question can be found in chapter 500 of the MPEP. This chapter covers the receipt and handling of mail and papers. The question and answer is from the 9th Edition, Revision 07.2015. This question comes from section 502.01 of the MPEP. The following is a brief summary of section 502.01. This section covers facsimile transmission including what type of correspondence may be submitted via facsimile and those that may not. The date the complete transmission is received is considered the date of receipt. Transmission on holidays and weekends are also covered. The receipt procedure for filing a CPA by fax is discussed. What are the 3 major types of patent status? The 3 major types of patent status include: pending applications, abandoned applications, and issued patents. The answer to this question can be found in chapter 100 of the MPEP. This chapter covers Secrecy, Access, National Security, and Foreign Filing. The question and answer is from the 9th Edition, Revision 07.2015. This question specifically comes from section 101 of the MPEP. The following is a brief summary of section 101. Patent applications must be kept confidential. Approved patents, however, are freely open to the public (unless they are under a secrecy order). There are 3 major types of patent status. These include pending applications, abandoned applications, and issued patents. 37 C.F.R. 1.14 discusses the rules regarding the confidentiality of an application’s status. In addition, 37 C.F.R. 1.14 covers the confidentiality of patent applications in regards to instances when application status may be revealed to private parties within the public. 35 U.S.C. 122 states the specific times when patent related documents will be published by the PTO. Get a Complete 3-Step Patent Bar Review Course. — Trusted course since 2001. 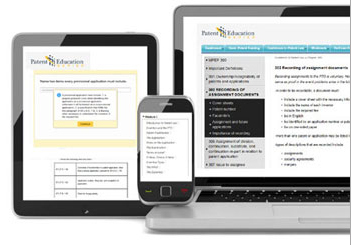 — Flexible study options including interactive, online format. Learn more and get started on the path to passing the patent bar today!